The earliest well-documented human occupations of the North American Arctic, which date to between 11,000 and 6000 years ago, are assigned by archaeologists to a poorly defined cultural tradition known as the Paleo-arctic tradition. 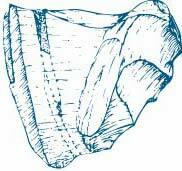 It is known only from stone artifacts, especially microblades and small bifaces. The most diagnostic artifacts are a distinctive kind of stone core from which microblades were manufactured: the so-called wedge-shaped microcores. Sites, including a very famous site called Onion Portage, are found in Alaska and reflect a terrestrial (in other words, land-based) adaptation although that may just reflect the fact that rising sea levels since that time have now left underwater all coastal sites occupied by these people. Onion Portage is a deeply stratified inland site located on the Kobuk River, Alaska. The site appears to have functioned as a hunting station to intercept caribou crossing the river here, or for fishing. There is presently not much evidence to link Paleo-arctic tradition occupations to the Arctic Small Tool tradition occupations which succeed it in this area. Click here to see three views of a microcore from the Paleo-arctic tradition.